new silicone gasket for the rebuilt engine when it was completed, so here it is. remove the cover many times without having to replace the gasket every time.. 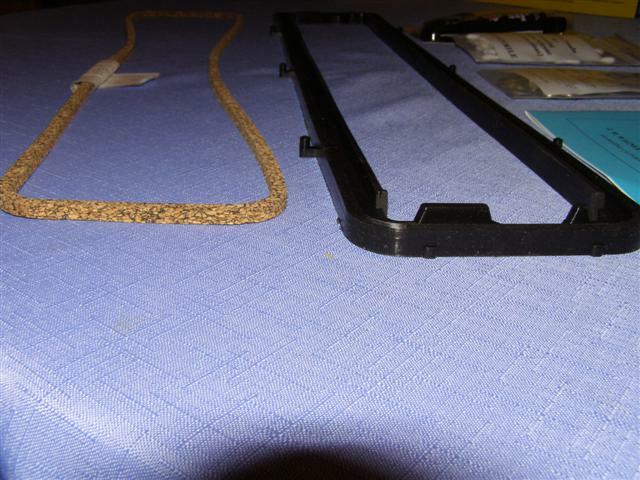 This is what you received when you ordered the gasket kit for the TR6. 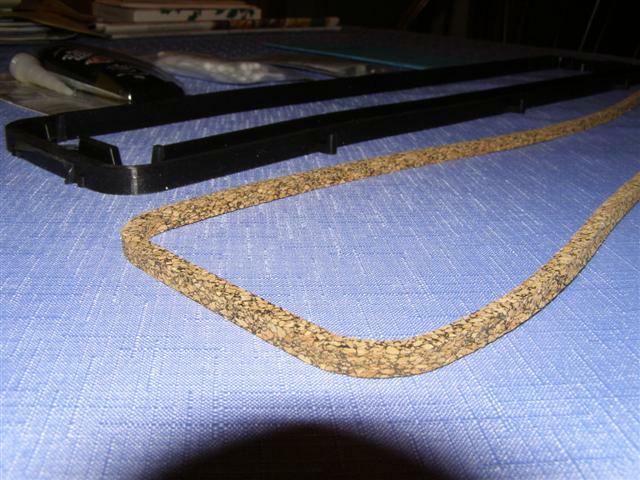 The original cork gasket is shown for comparison only. The new silicone gasket is formed to the shape of the cover with an inside lip. 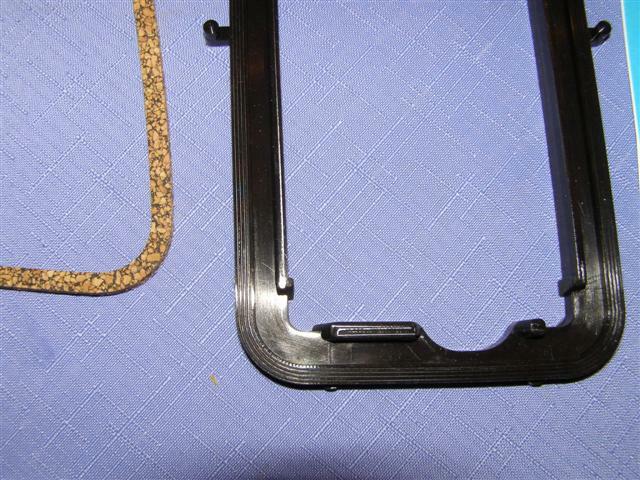 As you can see, there is a lot of difference in the thickness of the two gaskets. There are cut outs located on both ends that must be placed on the left side of the head. First step is to remove the valve cover and clean the mating surface of any oil or old adhesive. If these areas aren't clean and dry, you may have sealing issues down the road. The instructions state that the gasket should be laid down and trial fit. Notice the cut outs on each end for the head bolt? They favor the drivers (left) side). It looks to be a little short, but it will stretch out after you fit it to the valve cover. So there it is, ready for the test fitting of the valve cover. I am following Justin's blue book. Now's the time to get the gasket fitting inside the cover properly. Justin clearly states that you will need a new gasket to correct your error. These pictures were for my benefit as well to look back and remember what I did. This is the little blue book that I've been following. Cheaper than buying two gaskets! This is explained well enough for me to even do it correctly. I started with the 3/16's" of silicone sealer all around the outer lip of the gasket. Next 3/16's" of sealer on the same groove where the old cork gasket would have lived. Nice and neat. so far, but you do get to get messy on this part. This was not in Justin's little blue book, so I did stray from the instructions a little bit. keeps your finger clean throughout the process and from getting sealer on everything else. about 1/4" of gasket all of the way around the head. Make sure that you do at this time. OK on the right front corner. OK on the left rear corner. And OK down the left side and around the corner. care and precautionary issues are covered in the all encompassing little blue book. 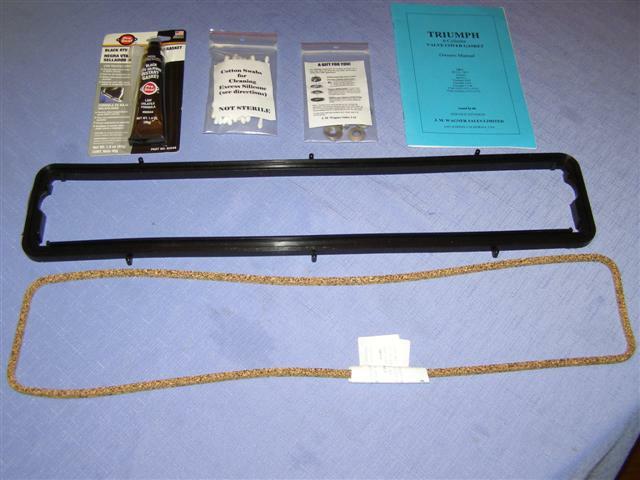 All in all, a very nice product, well documented and all parts are included in the kit. It's truly a shame that this is no longer available.